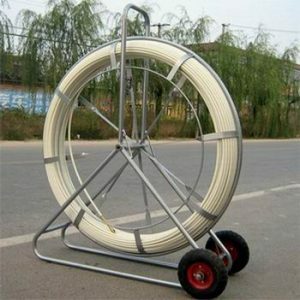 Sometimes people are accustomed to call it a fiberglass duct rodder, fiberglass punch. It plays a very important role in our life, but how much do you know about the threading material? Here let our professional threader manufacturers for everyone to answer it! The main material of the duct rodder is the product made of the combination of the glass fiber reinforced layer and the high-pressure low-density polyethylene protective layer, which is why the fiberglass threading machine is named. What about threader specifications and related standards? FRP threading rod diameter is generally between 11mm-18mm, the rod length of 100m-400m, it is suitable for a very wide range of temperatures, in the range of minus 40 degrees Celsius to eighty degrees Celsius, it can be normal Work, and will not affect the efficiency of work, the minimum bending radius of FRP perforator is 295mm, and its traction fracture tension is about 5t. Its role is mainly used in the pipeline of the traction guide rope, in the TV cable, network cable, food line through them, which have applications, not urgent and difficult to operate simple, and greatly improve the work efficiency, is an efficient power construction tool.